Would You Pay For Gory Nairobi Hotel Attack Photos? 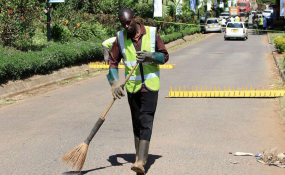 A groundsman sweeps the entrance to DusitD2 Hotel. Tenants at 14 Riverside office complex can now access their premises after police on Tuesday granted access to the scene of last week's terror attack. Car owners who abandoned their vehicles during the attack have also been allowed to collect them. Police Spokesperson Charles Owino has said that the complex has been cleared of hazardous materials. "The tenants can access their premises at the complex from Tuesday morning," he said. On Tuesday last week, five gunmen stormed the complex in a terror attack that killed 21 people. Approximately 700 people were rescued during the attack, according to Red cross. In the attack, one suicide bomber blew himself up while four others were killed by police. Their bodies were taken to the City Mortuary on diverse dates between January 16 and 18. Investigations into the attack is ongoing.